or by email at oxfordantiquitiesandfossils@gmail.com. Medieval Mount for a belt or horse harness decoration. Circa 15th - 16th century. Length 43mm.Weight 45.6 grams. Free standing polished goniatite fossil. Goniatites are shelled cephalopods related to the squid and octopus that form the order Goniatitida. Goniatites originated in the middle Devonian period some 390 million years ago. Similar to their relative the ammonite being a free swimming animal possessing a head with two well developed eyes and arms (tentacles). We have several specimens on display, prices starting from ?5. A genuine dinosaur age specimen in a museum style presentation. Over 65 million years old the Mosasaurus was the prehestoric T Rex of the oceans. Family; Mosasauridae .Period; Late Cretaceous - Maastrichtian Date; c65 million years BP. Thought to be an ancestor of the largest predatory shark to have ever lived the extinct Carcharodon Megalodon and its living relative todays Great White shark. These specimens are from the Early Eocene c 52 million years ago. The age of these teeth is approx, it is usually based upon the formation that the teeth were discovered in. These teeth were discovered in the High Atlas mountains of Morocco, North Africa at a height of 11,000 feet. One of the earliest giant sharks, that may be the ancestor of most, if not all, living Mackeral Sharks. Megalodon, the largest predatory shark ever to have lived is a descendant of this giant shark. Its living relatives are the two current rulers of the open water, the White Pointer (Great White Shark) and the Blue Pointer (Mako Shark). We have several specimens on display. Mounted from ?6, and necklace and pendents from ?4.50. This specimen has been cut through the middle and then polished to reveal two halves of the Ammonite that show all of the body chambers.These chambers have been preserved in Calcite and Limestone and show the internal structure of the Ammonite.Albian - Aptian 110-120 Million years old, Mid Cretaceous,from Madagascar This specimen measures 5.6cm at the widest and is in very good condition. A string of genuine Roman beads. The string consists of 192 individually crafted beads of turquoise coloured glass,ranging in size from 1 - 5 mm Length:- 17 inches circa 100-400 A.D. Found on diverse Roman sites in Libya. Free standing multi Orthoceras fossils from the Devonian age, set in limestone deposits from Morocco. Approx 350 million years old. Orthoceras were a type of squid like creature that teemed in the oceans of the Devonian period. We have several sculptures on display, prices from ?10 - ?28. These stunning sculptures make very unusual gifts. 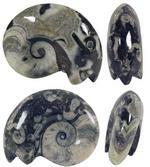 Goniatites are Ammonoids with a distinctive goniotitic zig-zag pattern in the sutures that mark the spiraling growth of the shell. The extinct ammonite that decended from Nautiloids is an example of the remarkable symmetry often found in nature. Mineral exchange over the eons can create an amazing array of contrasting colors and the beautiful natural display you see here. Ammonites were Cephalopods sharing a common ancestor with the squid and octopus. The ammonites that appeared in the Devonian became very diverse and widespread in the Paleozoic and Mesazoic before going extinct along with the dinosaurs at the end of the Cretaceous period. The goniatites lived early in the Devonian period, some 400 million years ago, and became extinct during the Permian period. The Egg is a powerful symbol that carries many meanings, in both spiritual, physiological, and cosmological senses. It represents primordial chaos, the universal matrix, fertility, birth, rebirth, renewal, immortality, purity, virility, growth, protection, the Earth and eternity. The egg is sacred to Manu, Brahma, Vishnu, Osiris, Isis and Eostre. This is a string of genuine Roman turquoise beads (restrung) 100 - 400 A.D from Libya. The string consists of over 200 small individually crafted beads in turquoise length approx 12 inches average length of each bead 0.75 mm . Description Goniatites are Ammonoids with a distinctive goniotitic zig-zag pattern in the sutures that mark the spiraling growth of the shell. The extinct ammonite that decended from Nautiloids is an example of the remarkable symmetry often found in nature. Mineral exchange over the eons can create an amazing array of contrasting colors and the beautiful natural display you see here. Ammonites were Cephalopods sharing a common ancestor with the squid and octopus. The ammonites that appeared in the Devonian became very diverse and widespread in the Paleozoic and Mesazoic before going extinct along with the dinosaurs at the end of the Cretaceous period. The goniatites lived early in the Devonian period, some 400 million years ago, and became extinct during the Permian period. Fifty thousand years ago, the North Sea did not exist. The area between what are now the white cliffs of Dover and the Dutch sandy dunes was part of the continent of Europe and the natural habitat of woolly rhinos, Irish elks and other prehistoric marvels. On these fertile grounds they fed, fought, procreated and died for thousands of years. Then the ice came. The lowering of the earth?s temperature at around 25.000 B.C. caused the extinction of these fascinating creatures, their remains being buried by hundreds of meters of ice which covered the whole of northern Europe. Temperatures rose and melt began to set in at around 12.000 B.C., replacing the ice with water and so giving birth to the North Sea as we know it today. The remains of its old inhabitants were still there, however, now covered by a thin layer of sand and fathoms of salty water. Nowadays tidal currents cause the seabed to turn around, freeing the fossils from their sandy tome and causing them to get stuck in the sturdy nets of Dutch fishing boats that leave port every week, facing the dangers of the North Sea, to provide the world with the best that the sea has to offer. We have several pieces of Woolly Mammoth tusk (bark), prices starting from ?4 - ?20. Medieval Lead Field / Hop Tokens.Circa 15th - 19th century. Prices vary. Brazilian geodes begin as bubbles in volcanic rock or as animal burrows, tree roots or mud balls in sedimentary rock. Over time, the outer shell of the spherical shape hardens, and water containing silica precipitation forms on the inside walls of the hollow cavity within the geode. The silica precipitation can contain any variety of dissolved minerals, the most common being quartz, but amethyst and calcite are also found. Over a period of thousands of years, layers of silica cool, forming crystals of different minerals within the cavity. Different types of silica cool at varying temperatures, thus creating layers of different types of mineral crystals. Each geode is unique in composition and can only be truly discovered when cracked open or cut with a rock saw. 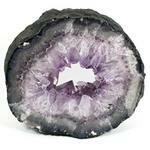 The size and formation of crystals and different shades of color within the crystals make each geode special. The rough exterior of the geode gives no indication of the secrets held within its core. The anticipation never fades for those who curiously collect buckets full of round geodes and eagerly expose the secrets of each individual sphere-shaped rock. This is a string of genuine Roman Lapis Lazuli beads 100 - 400 A.D from Libya. The string consists of over 200 small individually crafted beads in the highest quality Lapis Lazuli length approx 14 1/2 inches. The average length of each bead 1mm . Natural Quartz Cluster from Peru with many fine needle points.The points are clustered around a base of pyrites and Galens. One of the most beautiful varieties of quartz. This gemstone establishes the connection between the divine and spiritual side it has very strong protective power. It is basically found in Brazil. Amethyst is gemstone that gives success, it increases intellectual power, concentration and self confidence. This beautiful gemstone makes you more calm reduces your anger, makes you more patient as well as it improves your communication skills. Amethyst has a power to fight with insomania, nightmares, depression, it increases your divinity and removes your stress and nervousness. Amethyst is a powerful gemstone if you want to have good dreams just place it under your pillow. Ancient clay disc bead necklace measuring over 300mm in length. It comprises of many small ancient clay disc shaped beads which are of Near Eastern origin and date from the 1st millennium B.C. These have been restrung. Fossil Ammonite Stoneware from the Devonian Period from Morocco. Carved from natural formed rock containing ammonites and orthoceras specimens. All have a goniatite (ammonite)raised on the side as part of the design. They make great educational tools and conversation pieces. A string of genuine Roman beads. The string consists of approx. 60 individually crafted beads of glass in shades of green ranging in size from 2- 12 mm. Length:- 14 inches Provenance:- Diverse Roman sites in Libya. 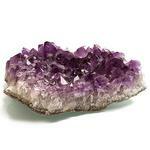 Special Amethyst Crystal Cluster Tea Light Holders are made from some of the best quality Amethyst found in Brazil. A signed and dated art sculpture made in stoneware by international designer Mark Parks. 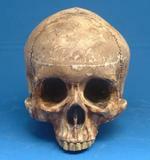 This sculpture is a replica of a medieval skull found in the reliquary of Downside abbey in Somerset. Promicroceras Planicosta, Juassic, Lower lias. From Stonebarrow,Charmouth(Lyme Regis. 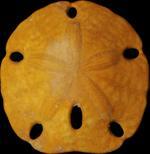 An unpolished Encope Fossil, Sand Dollar.From the Baja Region of New Mexico/California. Pilocene 2-5 million years old.